Gretchen welcomes Dr. Inge Auerbacher to Opus today. 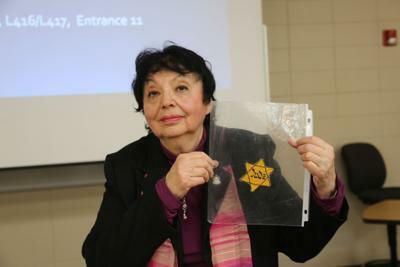 Auerbacher, a holocaust survivor, was in town to mark Tolerance Week in Sioux City this week. Holocaust survivor, Dr. Inge Auerbacher is Gretchen's guest today on Opus. Dr. Auerbacher was on hand to take part in Tolerance Week in Sioux City. She shares her stories about being taken out of school before finishing the 1st grade, her time at the Theresienstadt concentration camp, earning her PhD. and how she shares her story with thousands of children today. German born in 1934, Inge Auerbacher was taken to Terezín (Theresienstadt) concentration camp in Czechoslovakia at the age of 7. Of 15,000 children imprisoned at the camp, about 1 percent survived. Miraculously, her parents, who had also been transported to Terezín, lived. Upon returning to the place that had been their home, the family discovered thirteen close relatives had been slaughtered by the Nazis. They soon immigrated to the United States. Following Holland's fall to Hitler's army, Diet Eman's Jewish friend Herman was told to report for transport. Upon hearing this, she and her fiance, Hein Sietsma, made the decision to risk their lives for their beliefs. Diet and Hein would later be sent to concentration camps for their acts of resistance, and Hein would indeed lose his life. Diet survived. She came to the United States and made her home in Michigan following the war, and she began to tell her story. The author James Schaap happened to be one of her listeners, and, taken by her story, offered to be her biographer. Today is Yom HaShoah, Holocaust Remembrance Day. It is a solemn day, one that causes us to meditate upon our most frightening nature, directing us to look at not only the horrors of our past, but the violence, intolerance, and indifference of our present. In this broadcast, we hear from Inge Auerbacher, who, as a child, was transported with her mother and father to Terezin, a Nazi concentration camp. Ruby: Do you ever like to try to draw the pictures of your past experiences? Inge: No, I'm not a good artist no. You know what I say, I paint with words. Ruby: That's a good way to word it. Ruby, host of this episodes Kid Talk, interviews Inge Auberbacher who is a Holocaust-survivor and author of the the book I Am a Star. The interviews was conducted in honor of Tolerance Week. Ode plays at the Marquee with opening act Edem Soul Music, there's art at the Benson Building and we blast off into a month of One Book One Siouxland with Margot Lee Shetterly's, Hidden Figures.